In The New Moon's Arm, Calamity Lambkin has just buried her father after years of caring for him. Their relationship was strained. When Calamity was a teen, she got pregnant after an afternoon of experimentation with her gay best friend. Calamity raised Ifeoma on her own in Cayaba but she wasn't always a good mother. Now a grandmother, she just can't accept that she's getting older even though menopause is staring her in the face. The recent hot flashes aren't just a precursor to the Change, they are bringing a past talent with them. Once when she was a little girl, Calamity could find anything that was lost. Now, once again she's finding things with a vengeance; lost childhood objects are falling from the sky. After a storm, she finds a little boy washed up on the shore. He's no ordinary boy though. Calamity suspects that he's one of the "sea people," creatures a part of the mythology of the island. Calamity is determined to keep the little boy to herself which only causes more tension between herself and Ifeoma. 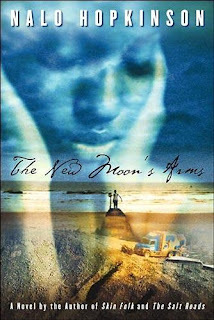 The New Moon's Arm is a layered story; it's partly fantasy, but Calamity's personal life feels quite real. Her life is pretty complicated without supernatural powers or creatures. There were times I just wanted to strangle her. She's prickly to say the least. At times, it's very hard to like her. She just can't stop herself from saying the most hurtful things. Mostly, what she says is to protect herself. She's had a very hard life. She's a much more fragile person than she let's on. I didn't find the supernatural elements too odd, in fact, they fit in nicely with the Caribbean setting. You'd expect mermaids swimming around down there! It was the perfect blend of fantasy and reality. I was somewhat confused about a few things at the end and wished that those things were better explained. However, I enjoyed the writing style which made for easy and quick reading. I'd definitely read more of Nalo Hopkinson. Recommended. What an interesting book! I wish menopause would bring some talent of mine to light. What a great cover! This sounds like an amazing read! I LOVE the cover, I think I'm going to have to put this on one of my wishlists. Do read Brown Girl In The Ring. I have Skin Folks but I haven't gotten to it.